Motorbike Helmet speakers are the most loved bike add-on around the world. A helmet plays the most crucial part while riding a motocycle and if it is equipped with speakers than you can enjoy your journey. The Helmet is made in such a way that it relaxes your ear and maintain a perfect volume. This unique helmet can be used with any motocycle. It is padded with high-quality pads inside the helmet to give the user a invariable feel while riding. The soft, padded speakers attach to the inside of your helmet by hook and loop fasteners pads (included), have a volume controller as well as a microphone which make you more comfortable to use. LX-FT4 Motorcycle 4-Way Bluetooth Conference Intercom. This product has a 2,000 meters (1.2 miles) bike-to-bike full-duplex intercom maximum range, includes Bluetooth stereo wireless helmet headset(s), and is designed for installation into most open face, modular, and full-face style helmets. With the LX-FT4 you can call hands-free on your Bluetooth mobile phone, listen to music or voice instructions of GPS navigation, and activate wireless Intercom for rider-to-rider or rider-to-passenger intercom talk within a range of 2,000 meters (1.2 miles) (if four units are connected). 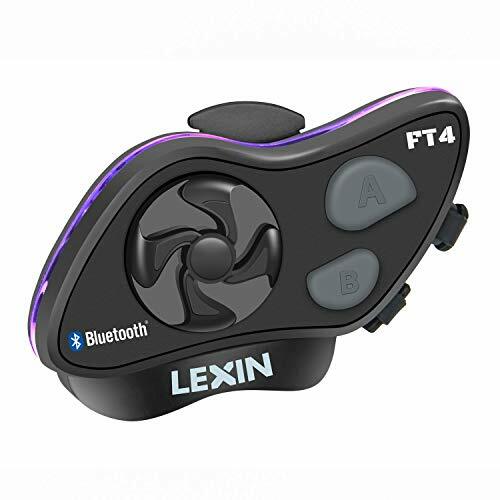 The LX-FT4 is compliant with Bluetooth Specification V4.0 supporting the following profiles: Headset Profile (HSP), Hands-Free Profile (HFP), and Advanced Audio Distribution Profile (A2DP). It supports universal pairing with most Bluetooth headsets on the market. The user can activate Siri or S-Voice from the main unit for voice dialing and other voice commands. The FM radio tuner is built into the main unit and allows for station scanning. Superior audio fidelity has been achieved with our high fidelity, non-ported, and ultra-slim helmet HD speakers. This headset also provides the industry’s best combination of wind and ambient noise reduction with the miniature boom microphone. The main unit is powered by a rechargeable lithium ion/polymer power cell that provides 10-15 hours of active use from a full charge. standby time is over a week.The NEW Lexin Moto FT4 Bluetooth communication device is designed for Motorcycle riders that want to be seen, safe and connected! The kit includes all accessories you need to fit a open face, modular, or full-face helmet. Superior audio fidelity has been achieved with our high fidelity, non-ported, and ultra-slim helmet HD speakers. This headset also provides the industry’s best combination of wind and ambient noise reduction with the miniature boom microphone.